Pink is a happy color today. The folks at Balloons Make Me Happy reached out to us with their dark blue Nissan NV 2500 passenger van. Looking quite ordinary, it wasn’t helping them book events. Our 3M certified team developed this head turning design for and then wrapped this decorator’s delivery vehicle with premium 3M IJ180MC films which have a removable adhesive system. The now pinkified van is getting thousands of daily impressions from prospective clients by leveraging high a high impact vehicle advertisement. This is great news for the resale value of this brand new van. The cost of van wrapping greatly diminishes when you consider the boost to residual value of the vehicle. This wrap protects every square inch of the brand new paint from the effects of UV sun damage, scuffing, and some stone chipping. Our average tech can remove a wrap like this in under 2 hours, which can also be done by any relatively skilled hands and a heat gun. On occasion, there will be a few small areas with glue residue remaining behind. This can easily be removed with most bug and tar remover products. It is important, however, to be sure to remove your wrap within 7 years of its original installation date. The wraps do become more difficult to remove over time. The vinyl does eventually dry out. The glue also dries out and becomes tough to get off as you near the 10+ year mark. Most folks can recall the last vehicle wrap they’ve seen. Can they speak this way about any other form of outdoor advertising? Likely not. With a landscape of countless marketing messages one may encounter through the day, it is imperative to stand out. Not standing out could mean that you disappear into the background, and to be nameless. This type of anonymity is what keeps micro sized business small and unable to grow. It maybe not enough lately to do the basics. These basics may include offering quality services and the good ole’ “service with a smile.” While these are important attributes to keeping the doors open, they may not be sufficient when it comes to building a sizeable business. Some sort of advertising must be in play for true business growth. Having a web presence has become standard for most businesses. A new facet of web advertising is called inbound marketing. If not familiar with this new endeavor, inbound marketing are the actions taken to drive prospects to your website and compel them to give you their contact info or make a purchase. Most traditional types of inbound tactics may include Google Adwords, banner ads on popular websites, and search engine optimization (SEO.) Many of these methods can easily add up to tremendous budgets caused by high pay per click costs or big agency bills to develop a competitive SEO strategy. Imagine paying over $10 per click just to have someone view your advertisement. This can be costly, considering there is no guarantee that you’ll close a sale, much less get contact information from a lead. The great news is there are other means to drive traffic to a website. A vehicle advertisement can be a powerful tool to create some curiosity and bring suspects to websites. In addition, it could be the lowest cost lead magnet when considering the lifetime cost of the investment. If a wrap may have an investment amount of $2500 (varies per vehicle type and coverage amount,) then the life cost could be calculated at $44.17 monthly, including sales tax. This amount is 1/3 the cost of our phone bill at IDWraps.com. When considering the purchase of 5+ years of advertising, the value and ROI become rather obvious. Suspect makes a purchase. Mission accomplished! 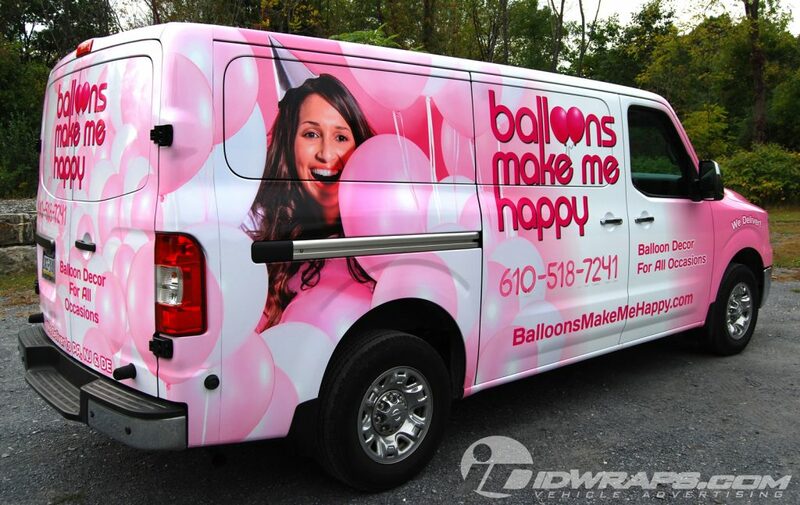 Our IDWraps.com vehicles keep it very simple when it comes to design. As you’ll see below, our Honda Insight wrap exhibits a very limited amount of information. There is actually a bit of advertising science behind this, as less is truly more when it comes to vehicle wrap content. When folks give you 2-3 seconds to develop an impression, it is imperative to get your point across very quickly. Our layout states, what we do, who were are, and how to reach us- all in a concise package. If you can win people over with just a glance, you are on the road to success. Every day we see vehicle graphics that have cluttered layouts that are outright confusing to prospects. How in the world am I to buy from you when I can’t even read your vehicle advertising? Over the top font selection, lack of contrast, too much information, and poor element hierarchy are just a few offences that make a design totally ineffective. Imagine investing a few thousand dollars into advertising that actually hurts your business. Many owners of these gaudy designs don’t even realize the damage being done. Most folks are just too nice to tell them about their unappealing business image. Some business owners just have bad taste and they have to live with it. In these cases, this would be an example of the need for a commercial graphic professional. In our photo, you’ll notice a nice tie in to a great charity to work with. Our office serves as a drop off point for Toys for Tots every holiday season. We do a hood wrap on one of our vehicles at the start of each winter season to help promote this wonderful charity. This participation makes our staff feel good to play a part, as well as a positive vibe is seen from our clients. This is a total win-win for everyone involved. It is a great idea to partner up with a local charity when doing a vehicle advertisement. There’s always a good spot to add in a logo or two on your wrap. In our case, we include this on a whole side of the vehicle. Hoods are a great spot, as they have a lower cost per square foot, as opposed to more curvy areas such as fenders or bumpers. Hood coverage costs the least per square foot than any other area on a car. We do plan to use charitable partnerships on additional vehicles. 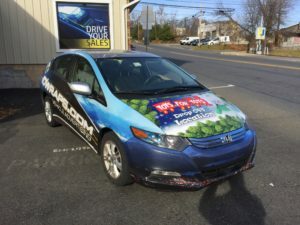 This Honda Insight can be found parked in front of our shop in Slatington. With over 18000 vehicles passing daily, this vehicle advertisement draws a ton of attention and helps us get more toy donations for Toys for Tots. Being located on a busy corner surely has its perks, especially for an owner of a vehicle wrap. They supply the toy boxes, and we promote the cause with our vehicle wrap and email blasts. We’re always sure to add in our own personal donations to help fill the gift boxes. Toys for Tots actually picks up the big gift boxes a few weeks prior to Christmas so they may distribute the toys to less fortunate children before Santa is due to arrive. Check out our friends at Toys For Tots by clicking here. For the balance of the year, we revert back to our standard IDWraps.com logo, where it continues to drive our brand- and our sales!